Leaders, Stay Informed: Knowledge = Power! The old saying, “Knowledge = Power” is more true now than ever. In today’s economy, leaders everywhere must know what is happening in their industry and the economy as a whole. They must be up to date on trends and major changes coming. If leadership fails to stay on top of the trends, they can lose speed with their competition and possibly even their relevance. Over the past few years, several companies have lost their relevancy because they failed to follow the trends of their industry and the economy. They lost pace with their competitors and either went of business or changed ownership. Blockbuster Video has done a poor job of keeping up with the trends. As a result, they are struggling to survive and have filed for chapter 11 bankruptcy. They were very popular for many years, but failed to keep pace with the competition. While their competition began renting DVDs from vending machines and allowing movie rentals directly to your TV and computer, Blockbuster maintained their brick and morter stores. Blockbuster’s video rental stores required high overhead costs to keep each location functioning with their personnel. In addition, the just maintaining the physical facility of the stores added additional sunk costs due to the keeping the buildings operating. Those are just two industry trends they failed to follow at the right time, but there were probably other factors that led to their downfall as well. Blockbuster is struggling to stay afloat while Borders Bookstores already went out of business. Just like Blockbuster, Borders maintained their brick and morter stores while their competitors went to strickly online stores. Borders offered a number of services at their stores from movie and music sales to coffee shops in addition to their core book sales. Those services were things that other bookstores did not offer that gave them a niche. The leaders within Borders thought the niche was enough to go against the trends, but in the end it was a fatal mistake that lead to their downfall. Both Blockbuster and Borders failed to keep their knowledge relevant for the industry. They became complacent and lost all of their power in the process. As a leader, what are you doing to keep up on the trends? Are you regularly learning what is going on so that you have the power to stay relevant in a changing world? If you aren’t, you will be the next store on the list of good companies that went out of business. 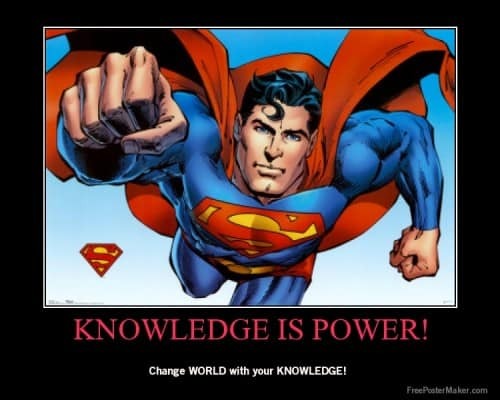 How has knowledge led you to have power? Please comment in the comment section below!